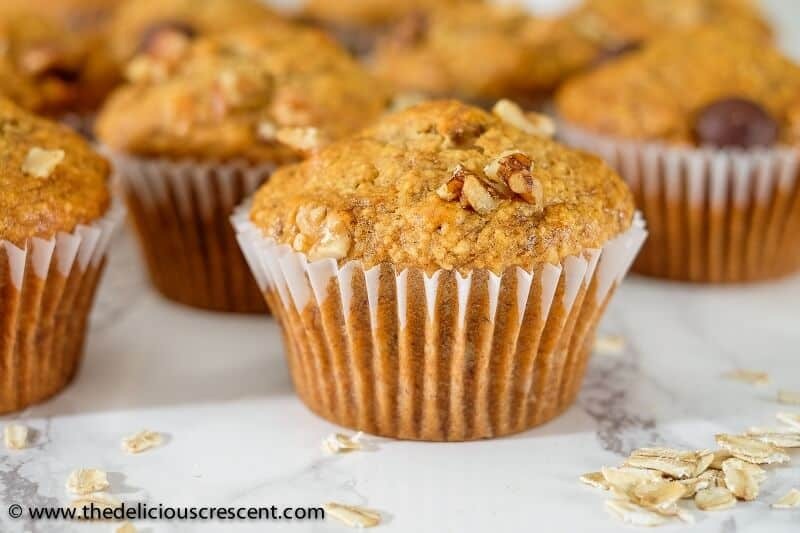 Moist and delicious oatmeal banana bread muffins are so easy and healthy. They are great for a treat, as a snack or for breakfast. What a lovely way to start your morning with so many healthy ingredients! Just like my incredible Granola with Cashew and Cardamom, and Barley Porridge with Blueberries and Walnuts. 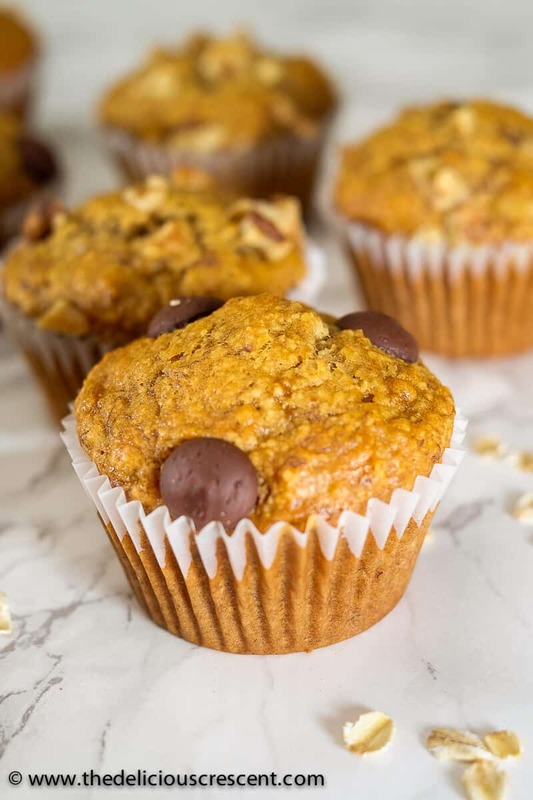 These banana muffins are made with mostly oats. Toasting the rolled oats and processing it into a fine flour and combining it with traditional banana bread ingredients gives you an INCREDIBLE taste experience while nourishing your body. Enjoy it with milk, tea or coffee and it will feel like you are having a dessert for breakfast while being healthy. They are really SO moist! Toast rolled oats at 350 degrees F for about 10 to 15 minutes. Process the oats in a food processor until finely ground. Using the back of a fork mash the ripe bananas in a medium bowl. Whisk the olive oil with honey. Add eggs and whisk one at a time into the mixture. Then add the yogurt and stir. Add vanilla, ground cinnamon, baking powder, baking soda and salt. 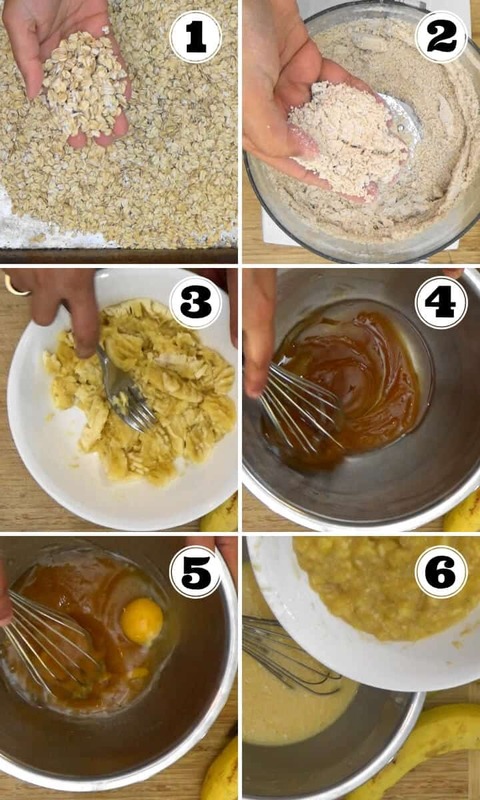 Mix the ground oats and flour into the mixture and make a thick batter. Finally add the chopped walnuts, raisins or other mix ins. Spoon the batter into a prepared muffin pan (greased or lined with paper muffin liners). Bake at 350 degree F for about 18 to 20 minutes, until a tester inserted comes out clean and the muffins tops are golden brown. Following are the main ingredients used for making the oatmeal banana muffins. Whole oats are a good source of fiber, protein, vitamins, minerals and antioxidants. Rolled oats have a lower glycemic load, releasing sugar slowly from the carbohydrates, resulting in a controlled release of energy throughout the day and helps keep one satisfied longer. 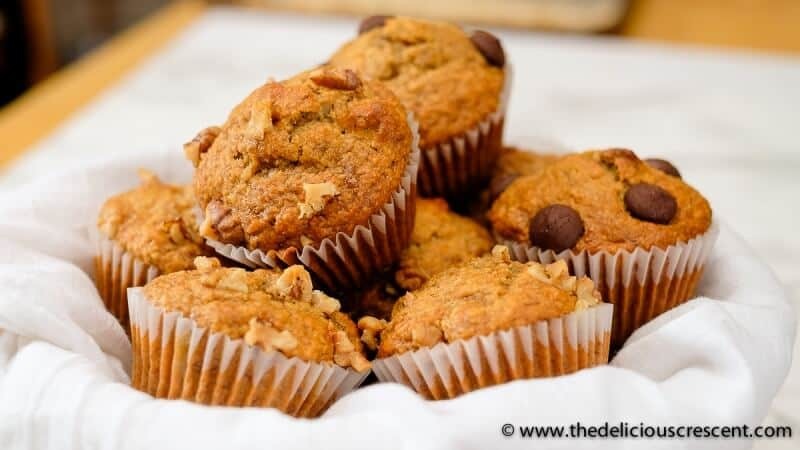 Bananas give sweetness and an incredible flavor for these muffins. They are a rich source of potassium, fiber, vitamin C, vitamin B 6 and magnesium. Olive oil makes the muffins moist and is a great source of heart healthy monounsaturated fats. The muffins are sweetened by honey, but you may also try maple syrup. Other than being a natural sweetener, honey also has antiseptic and antibacterial properties. From ancient times to modern days, honey has been found to be useful in wound management and fighting infection. I have used Greek yogurt for this recipe. It adds moistness, enhances the sweetness and adds to the protein content of the muffins. I think that a combination of vanilla and cinnamon with bananas is a classic taste that never fails. But you can always try adding variations to it, such as, cardamom, citrus, rose water, hints of spices – nutmeg, star anise etc. Gluten-Free: Make sure to use certified gluten free oats only or replace some of the wheat flour with Bob’s red mill gluten free flour. Nut-Free: The recipe includes optional walnuts. You can skip the nuts and/or use pumpkin seeds and coconut flakes. Dairy-Free: Skip the dairy yogurt and try coconut yogurt (I have not tried this myself). Or just increase the oil to 1/2 cup and skip any yogurt. Egg-Free: Use flax eggs instead of regular eggs. Vegan: Substitute flax eggs for regular eggs, use maple syrup instead of honey, use 1/2 cup oil and skip the dairy yogurt. Use Ripe Bananas: If the bananas are not ripe enough, bake them at 350 degrees F for 6 to 8 minutes until the skin darkens. Thick Batter: The muffin batter should be thick and with a consistency in between that of cake and drop cookies. Thick enough to mound. Adjust the amount of flour if needed. 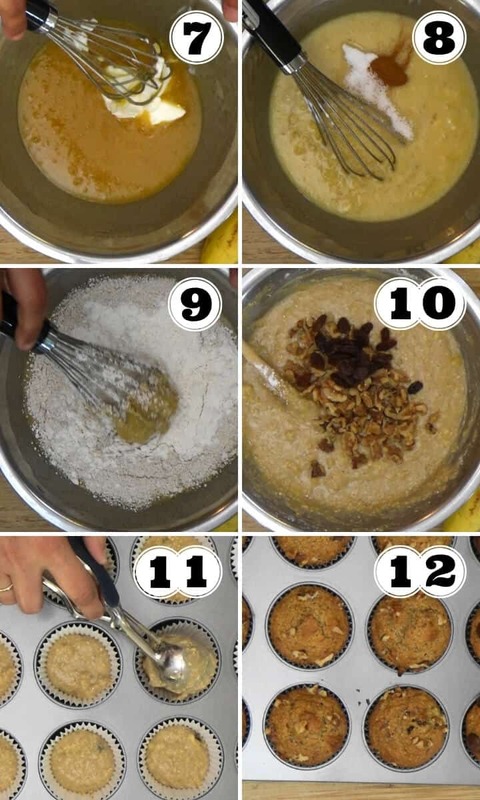 High Domed Muffins: For a nice domed muffin top, fill the batter almost full in the muffin pans. Hot Oven: You may preheat the oven to a higher temperature of 400 degrees F and then lower the temperature to 350 to 375 degrees F. This will help rise the muffins better. Add-ins and Toppings: May add chocolate chips or other dried fruits and nuts. You may sprinkle some oats on the muffin tops before baking. Storage: The muffins can be frozen in freezer safe bags of containers. These muffins are best for 1 to 2 days at room temperature. Spread the rolled oats in a thin layer on a baking sheet and toast for about 10 to 15 minutes. Let the oats cool. Whisk the olive oil with honey until well combined. Add the eggs, and whisk them one at a time into the mixture. Next add the mashed bananas and stir it in. Then add the yogurt and stir. Add vanilla, ground cinnamon, baking powder, baking soda and salt, making sure to whisk after adding each of these. Mix the ground oats and flour into the mixture and make a thick batter that forms a mound with a scoop. Finally add the chopped walnuts and raisins and stir. Prepare a muffin pan with butter and dust with flour. Or line with paper muffin liners. Spoon the batter almost full into the muffin cups. Bake at 350 degree F for about 18 to 20 minutes, until a cake tester inserted comes out clean and the muffins tops are golden brown. Tip: Preheat oven to 400 degrees F and then lower to 350 degrees F prior to baking. If the bananas are not ripe enough bake them at 350 degrees F for 6 to 8 minutes until the skin darkens. Make the batter thick enough to mound it with the scoop. Adjust the thickness with flour if needed. The muffins can be frozen in freezer safe bags of containers. 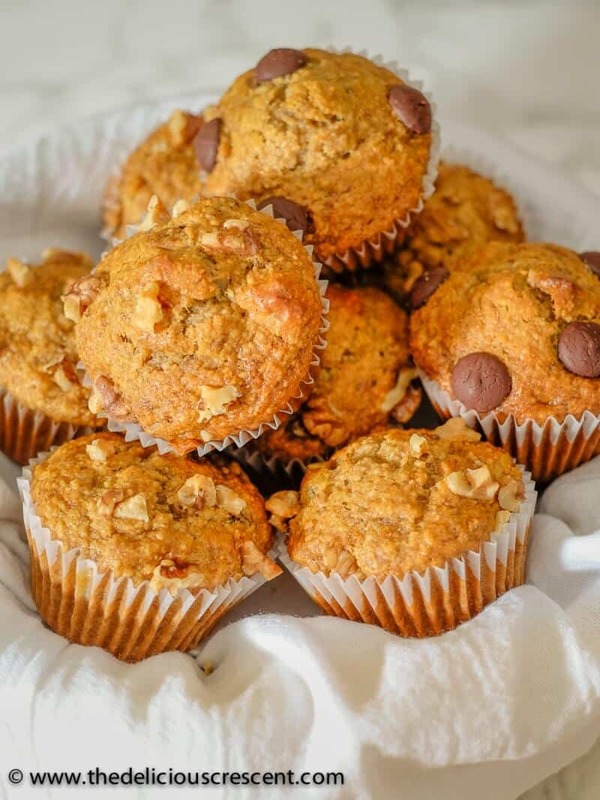 You may sprinkle some oats on the muffins tops before baking. These muffins are best for 1 to 2 days at room temperature. 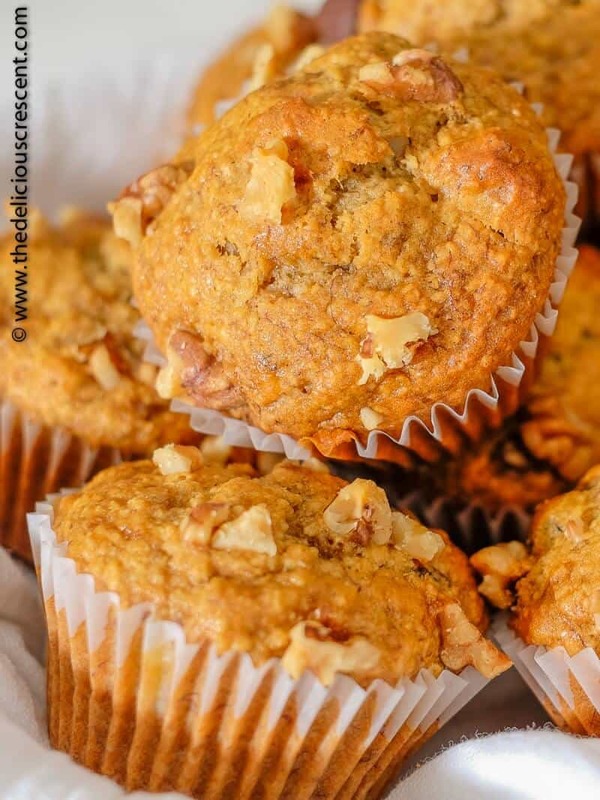 Banana bread is a family favorite and I love how you have made these muffins with oatmeal. The walnuts and raisins add another level of flavor which you typically don’t find in traditional banana bread. 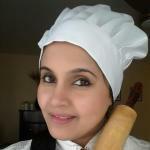 Thanks so much Vicky :) You have spotted the best things of this recipe – just my thoughts!